He is already a star at 20, but his stock continues to soar. Only Lionel Messi has scored more goals than Mbappe in Europe's top five leagues this season and Jose Mourinho recently called him "absolutely incredible" and said he thinks he's "the most valuable player in the world". With a rapid turn of pace - as he showed against Manchester United in the Champions League - along with quick footwork and sharp skills, Mbappe is a player worth watching whenever he plays. Netherlands' matches against Belarus and Germany will be the first opportunity to see De Jong in international action since his summer move from Ajax to Barcelona was confirmed. The midfielder is widely regarded as one of the best young players in Europe and has already endeared himself to Barca supporters by helping Ajax shock Real Madrid in the Champions League. His composure and skill was shown in one move at the Bernabeu when he won the ball from Vinicius Junior and then quickly jinked away from Ballon d'Or winner Luka Modric before bursting forward and passing to a team-mate. He looks set for a bright future at Barca. Currently enjoying a brilliant campaign with Borussia Dortmund, Sancho has already caught the eye with England thanks to a panenka penalty in training under the gaze of Gareth Southgate. 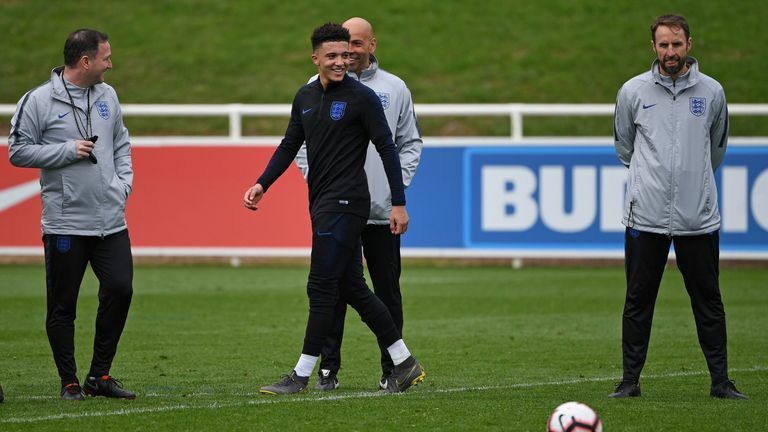 Sancho has won three caps for England, including one start against the USA in a friendly in November, but could be set to make his first competitive start over the next week. Raheem Sterling has described Sancho as a "great talent" and England fans should enjoy the dazzling footwork and quick movement that Sancho has shown in the Bundesliga this season. 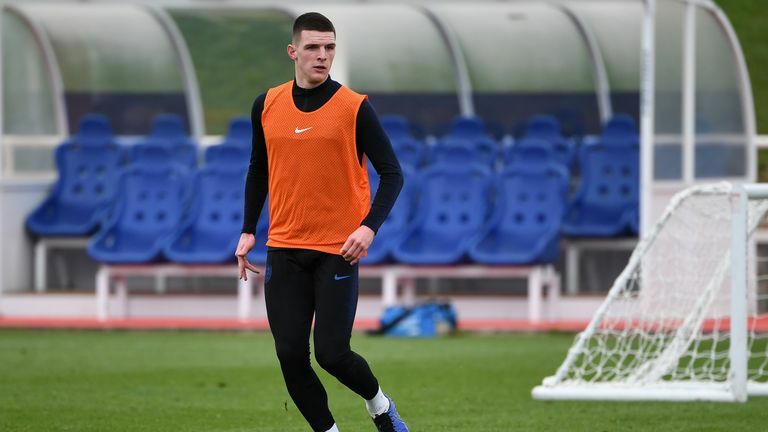 Rice was named in Gareth Southgate's England squad after being granted FIFA clearance to switch international allegiance from the Republic of Ireland. The 20-year-old, who has been in fantastic form for West Ham this season, said he was "bursting with pride" when he was called up. Former Hull and Fulham defender Liam Rosenior said on The Debate recently that Rice reminds him of ex-England and Manchester United midfielder Michael Carrick. "Declan Rice can sit in front of a back four. Read the game. He reminds me of Michael Carrick. "It's the tactical awareness and understanding that I am seeing from him that I don't see in many midfield players." Zaniolo is having a breakout season with Roma after joining as part of a swap deal from Inter Milan last summer. He has made 19 Serie A appearances for Roma, scored twice in the Champions League, and has already been compared to club legend Francesco Totti. Zaniolo is a versatile attacking midfielder who has been used in several different positions this season. Italy head coach Roberto Mancini, who called up Zaniolo last September without him having played a single Serie A game, says he has "real quality and he could develop into an exceptional player". Kean has been called up by Italy a few weeks after scoring twice on his first Serie A start of the season. The forward, who has just turned 19, made his first-team debut for Juventus at the age of 16. He has not had many opportunities at Juve since then, and could face an uncertain future as his current contract runs until 2020. That will be put to one side as he looks to make his mark with Italy over the next week. "Moise has won so much for his age. Let's hope he starts like (Mario) Balotelli did, which is very good," said Italy head coach Roberto Mancini when announcing his squad. "We have lots of good players, now the bar needs raising." The 19-year-old is one of several youngsters in Joachim Low's new-look Germany squad. A beneficiary of Mesut Ozil's international retirement, Havertz has already made 79 appearances in the Bundesliga, scoring 13 goals. He came on as a late substitute for his debut against Peru in August, but started in the 3-0 win over Russia in November, and looks to be a big part of Low's plans going forward. You might have heard Felix's name mentioned recently as his form for Benfica has reportedly attracted interest from several of Europe's top clubs, including Manchester United. The 19-year-old attacking midfielder has scored 11 goals and made six assists in all competitions. He has also featured in 18 league games for the Primeira Liga leaders this season. Manchester United's Diogo Dalot told A Bola this week that his Portugal team-mate has "enormous value" and could be a "world-class player". Defensive midfielder Ndombele is having a strong season with Lyon. Manchester United, Manchester City and Tottenham are among the clubs tracking the 22-year-old, who has enjoyed a rapid rise from playing in France's fifth tier in 2015/16. He is powerful, athletic and intelligent, or, in the words of France head coach Didier Deschamps: "He knows how to do everything in the middle." It has been a whirlwind few months for Swansea youngster James. After a proposed move to Leeds collapsed on Deadline Day in the January window, James scored a stunning solo goal against Brentford in the FA Cup - racing away from inside his own half and coolly finishing past the goalkeeper. The 21-year-old has played on the wing for Swansea as well as in a No 10 role and also up front. "It gives an option for me that, if I want to play him in different positions, then I can," said Wales boss Ryan Giggs. "He's a talent, and when you have speed like that, it always keeps you interested." Who's on Germany's new-look squad? Wales also have another quick youngster in their squad in Rabbi Matondo, who left Manchester City to join Schalke in January for 11m euros.